Well, you bought your gun. You’ve done a bunch of dry fire practice and have a good handle on how your gun works. 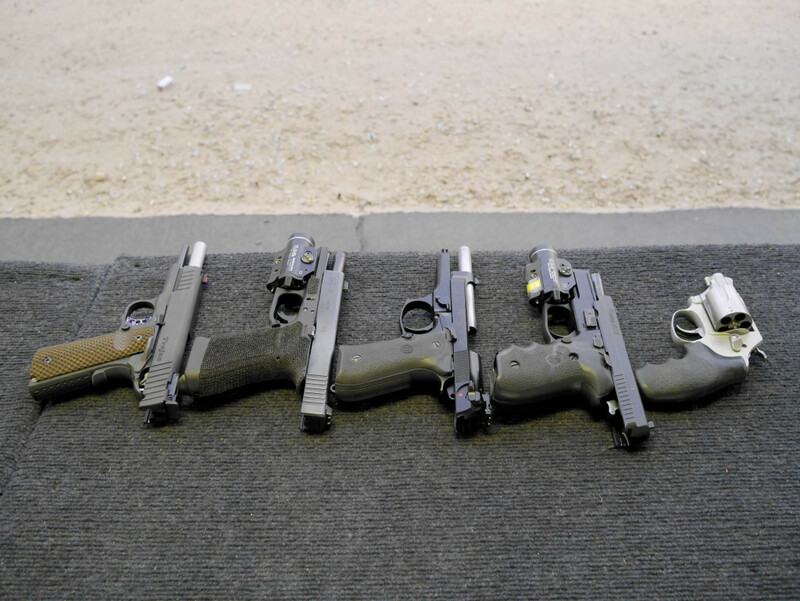 There’s only one thing left to do…off to the gun range! Hold on there, you can’t just walk in and start bustin’ some proverbial “caps” into some paper targets. Don’t hesitate to ask one of the employees any questions you might have. Trust me, they’d rather answer a beginner’s question than have to worry about the repercussions of a mistake. Whether you’re renting, accompanying someone, or bringing your own guns, here’s some information to make your trip to the shooting range a little more enjoyable. Every shooting range has their own set of rules, but here are some general tips. Listen to the Range Officer (RO). Bring eye and ear protection, get started with our Best Hearing Protection (2018). Sunglasses and prescription glasses are generally ok. Most will allow you to bring in your own ammunition for your own guns only. If you’re renting a gun, you’ll probably have to purchase the marked-up ammunition the range sells. Some ranges have additional restrictions such as no steel-core, tracer, or armor piercing ammo. These types of rounds can cause fire hazards or ruin targets. If you aren’t shooting, stand 1-2 yards behind the shooter. There will be a bright red/yellow line in front of the shooting table…do not cross it unless the RO says it is ok during a ceasefire. There might also be firing rate restrictions, such as no rapid fire or rapid fire that is limited to double-taps only. Most will also allow small children who can physically handle a firearm. Please keep an eye on your kids at all times! Pregnant women are advised not to go since there’s no hearing protection for the unborn. Check the range’s rules for spent brass casings. Some will not allow you to keep them since they collect and sell them. Costs can vary too. Some places charge one price for all day while others charge hourly. Phew, that’s a lot of tips…get ready for some more! Some shooting ranges offer rentals of guns. However, there might be some age limits (18 for shotguns/rifles, and 21 for handguns). Or you have to be in a group to rent (to mitigate possible suicides). 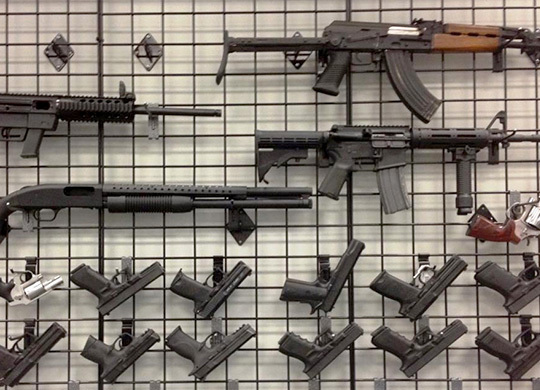 Renting is a great way to check out different styles and calibers. Even before you ever buy your first gun, see if any of your local ranges rent guns and go give it a shot. Keep in mind, these guns are usually maintained just enough to keep them working (if that). They are going to be a bit on the dirty and abused side. Still, it’s a cheap way to try some different guns out. If you aren’t 100% sure how the gun operates, ask an employee. On the range with live ammo is not the time to figure out how it works. You can start with our Beginner’s Guide to Guns. Don’t even think of going to the range if you don’t have a gun case. You don’t need some expensive hardshell case. 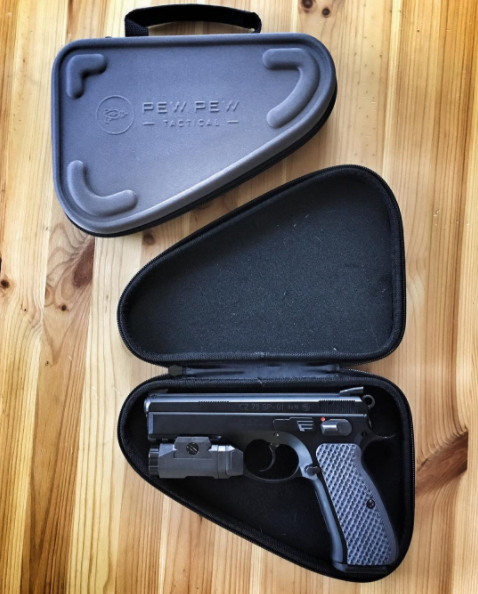 The plastic case your gun came with is perfectly fine. Heck, a small cardboard box is fine. You just don’t want to walk in there openly carrying the gun in your hand. You will get yelled at…or arrested…or both. And if you need some recommendations, check out our gun case article. Also, and I’m going to type this slowly and in bold letters to make absolutely sure the point is made…do not, under any circumstances, carry a loaded gun into the range. Unload your gun, make sure it’s unloaded, double and triple check that it’s unloaded before you put it into the case before you leave your house. Gun ranges don’t mess around with this type of thing. Make sure you have your gun unloaded and in its case before you go in. Go up to the counter, pay the range fee and buy some paper targets and ammo, if you need it. Just go with the cheapest stuff. You may also have to sign a liability waiver. Put on your ear and eye protection and then head into the range itself. Some places will walk you in and usher you to a bay. Other ones just hand you your receipt for the fees, point to the door and tell you “have a good time”. Set your stuff down on an empty bay. Go ahead and unpack your guns and mags and supplies. Keep your gun pointed downrange (“down range” means “towards the far side of the range where everyone is aiming and shooting their guns”). Somewhere, usually by the door, will be a big stack of cardboard sheets and a staple gun. Take one of your targets and staple it to one of those sheets. You only need one staple per corner. It’s ok to leave your stuff in your bay while you do this. Trust me, no one is going to mess with it. It’s amazing how polite and trustworthy people are when they’re in a small room where everyone is carrying multiple firearms. Most indoor ranges have electric target hanger…thingies. They are operated by a switch located inside your bay. Pull the switch in one direction and the clip comes towards you. Push it in the other and it goes further away. Clip your target up then move it down range. Distances are usually marked on the walls or floor. If it’s your first trip, swallow your pride and start with the 7-yard mark. Work your way to the back of the room over several trips. Outdoor ranges may have specific times where you walk out to place your targets. This is the fun part: Load up your magazines, load up your gun, and shoot. When you’re all done, remove your target from the cardboard backing and put it back on the stack you got it from. You can either save or throw away your target although I like to save mine so I can track my progress. Throw away the empty box your ammo came in. Toss off any brass that may have landed on the counter. Finally, most ranges have signs saying “sweep spent brass forward” or something to that effect. If you look around, there’s usually 2 or three brooms lying around. Take one and sweep the spent brass to the other side of the counter and away from the area where people are walking. Essentially: leave your bay cleaner than when you found it. Again, a lot of difference from each range but they usually focus on letting you know when it is ok to shoot. A “hot” range means it is ok to shoot. For ranges that have “cold” or “ceasefire” range time, the RO will let you know how much time is left during the “hot” phase. On ranges that have one, that man or woman is your king/emperor/god. What they say goes and you are not allowed to argue with them. These people aren’t on some kind of power trip. Their job, their sole purpose for existing is to make sure that you and everyone else in the room are as safe as humanly possible. It is a difficult job and one they don’t take lightly. If they make a mistake, if they miss one detail, there’s a good chance that someone will die. Keep that in mind when they’re telling you to do something. That range is their world and they’re graciously allowing you to shoot in it. 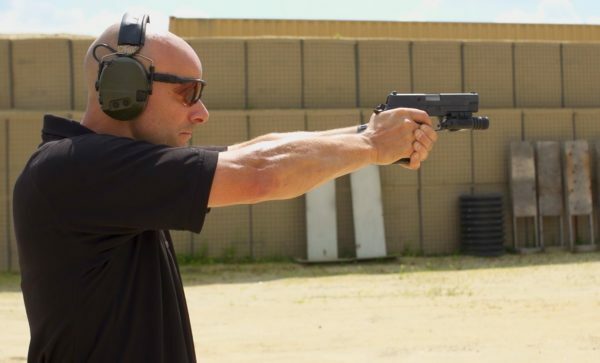 During the transition time when you can go mess with your target set up at outdoor ranges, you will need to unload and lock your actions open. This means locking your pistol slides or bolt back. Then step back and have the RO double-check. He will then allow everyone to go downrange to put up or fix targets. Some range will also require you use “chamber flags” which are plastic indicators that show there’s nothing in the chamber. Do not touch your guns at this time! 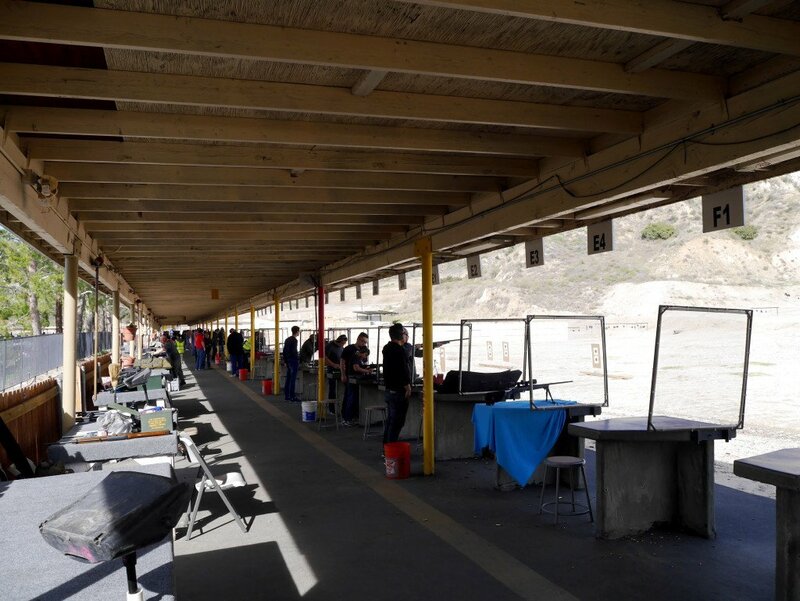 Indoor ranges are usually only around 25-50 yards and catered towards pistols. Most will allow rifle and shotgun rounds but may have additional ammo restrictions. You can see above that there are many shooting stations separated by panels. Try to move towards your bench so that your flying brass hits the panels instead of the person next to you. For just about every gun range, the bays are first come, first serve. Once you’re there, that bay belongs to you and the only person that can tell you to leave are the employees. That being said, don’t be a jerk about it. Don’t just set your stuff down then go for a walk. Claim your bay, prep your target, load up and fire your ammo. When you’re all done, pack up, clean up and get out as quickly as possible so that other fellow gun owners may enjoy themselves. Most ranges only have a dozen or so bays so everyone needs to be considerate about things. If you’re with a large group, try not to bother the shooter. I’ve seen it too many times where the shooter turns around with his gun and accidentally “sweeps” people with the muzzle. There’s also some sort of mechanism for moving paper targets back and forth. Usually, you don’t have to wait for a cold session. I’ve seen everything from draw-strings to high-end electronic systems. You can probably figure that stuff out on your own. Outdoor ranges tend to be longer than indoor ranges (100 to 1000+ yards) which really allows you to stretch out the legs of your rifle. I find fewer outdoor ranges have rentals since it seems like you can bounce out of there with it a lot easier. Outdoor ranges also usually don’t have closed partitions, but rather benches or individual stations. Targets can also vary a lot based on the range, but they can include metal targets (ting!) and places to put up paper targets. 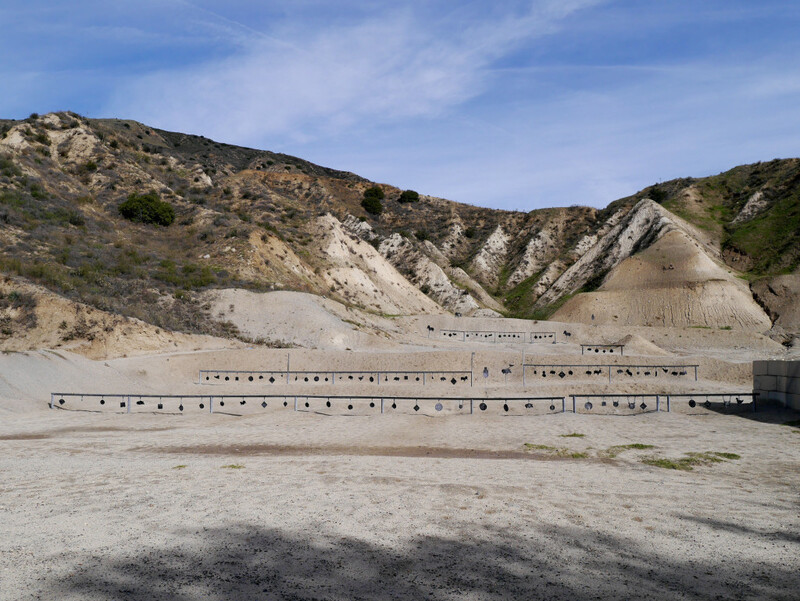 Check out the review of my go-to outdoor range (Angeles Shooting Range in Sylmar, CA) for how one place does it. There’s something unique about gun owners. We are a very proud group. We love our guns and love to show them off. We’re also, for the most part, a generous lot. I’ll give you an example: I was at the range one day and, between magazines, I noticed that the person in the next bay over had a very nice pistol. He happened to be reloading his mags at the same time so I complimented him on it. His reply threw me completely off guard: “Thanks! I love this thing. I’ve got a bunch of others but I usually wind up just shooting this one. Would you like to take a couple shots?” This complete stranger was offering me his gun and his ammo. I politely declined as I was still new to shooting and, as a result, was afraid I’d somehow damage his gun. The thing is, this wasn’t an isolated incident. I’ve had more than one person offer the use of their gun after I’ve complimented their pistol. That’s never happened to me with any of my other hobbies. Not once has another golfer at the driving range says “here, try out my driver”. Nor have I ever heard “here, try driving my 1957 Chevy around the block” or “go ahead and do a couple touch and goes with my Cessna”. I’d say more often than not, however, gun owners have generously offered their guns to me and I have since offered mine to quite a few people as well. With guns, and frankly with life, a little sincere flattery goes a long way. 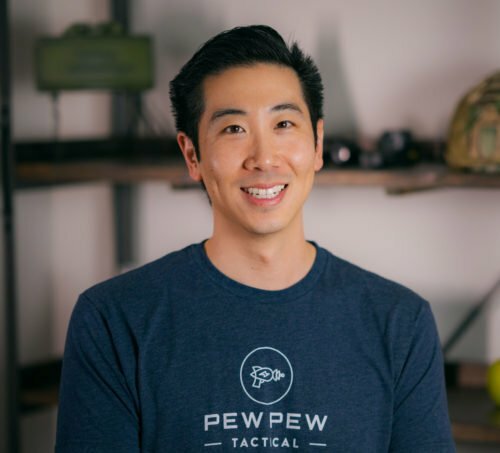 Want to learn more so you’re truly confident at the shooting range? Check out our video Beginner Handgun Course…full of only the important stuff…and without the attitude. Thanks for pointing out that most gun ranges will allow you to bring in your own ammunition for your guns. I am thinking about going to a gun range because I’ve never been, but my dad has a pistol that he would help me learn how to shoot. I think knowing how to handle a gun is a very important skill to have nowadays and so I think it would be important for me to learn. I shot my first gun around 1969 or 1970 with my father, I’ve been shooting for awhile. 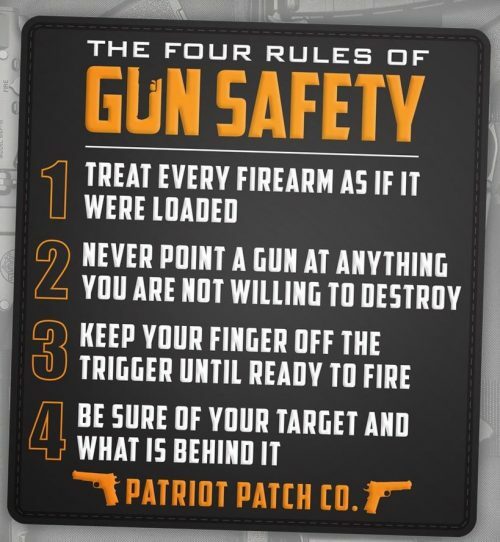 Except for people you want to avoid and stay away from, both new and old shooters will appreciate your attention to safety., Guns are generally safe, but can be very unsafe if handled wrong. Take it easy and learn. No one will care if you are new and inexperienced if you take safety seriously. Excellent read and accurate too! Wish I would’ve read this BEFORE my first trip to BA in Phoenix AZ. It was a learning experience and even though there is a video introduction in safety as well as how the range worked, we still made mistakes. Like Eric says…Ask first then you won’t have to apologize later! How much ammo and range time per week would you suggest for a busy college student? Grear article. Just getting into guns. Finn made a great point. Great for added clicks and as a resource to keep folks at the site…?